I’ve recently become interested in making “machines” of various sorts. I was sorting through some of my RC (radio control) plane “stash” the other day and came across various brushless motors and electronic speed controllers (ESC) like these. In RC, Brushless ESCs are usually connected to a radio receiver which generates servo control pulses. 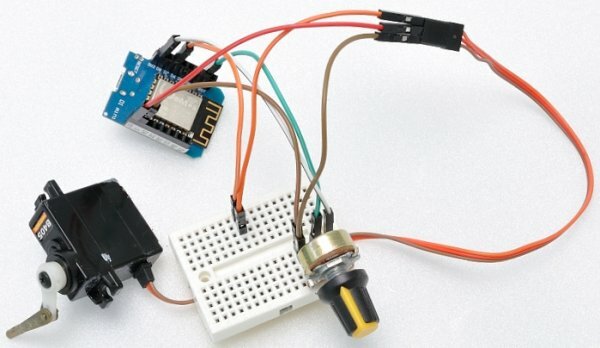 So this morning I thought it would be fun to try and get a Wemos D1 mini controlling a brushless motor. I’ve done similar before. I can remember, back in the dark ages of 2013, using a Guzunty Pi to generate servo control signals to drive a brushless ESC. I’ve also controlled servos directly with Arduino before now. This is handy because Wemos D1 mini can use the Arduino IDE. There’s also a ‘servo’ library that we ought to be able to use. …which is a built-in demo sketch that makes a servo cycle from 0 to 180° and back again – forever! It worked perfectly. YAY! We’re getting there. Next step was to incorporate the analog port to read the potentiometer and set the servo position accordingly. This also worked perfectly with a servo. Twiddle the potentiometer and the servo moves accordingly. YAY! So I took out my trusty “servo driver” and tried the ESC with that. It worked fine. “Oh!” I thought. The wiring looked good, so maybe it’s something to do with the Wemos‘ 3V3 logic levels? 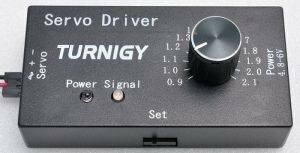 So I tried a level shifter to output a 5V signal. This didn’t help (you’ll see why later on). So, fresh out of excuses, I decided to “get the ‘scope’ on it” and see exactly what was happening with the signals. The only appreciable difference was in the pulse widths. But since pulse width is the language of servos, it matters. The Wemos“zero point” of 0.6 ms is a lot lower than the 0.9 ms of the servo tester. So you can see our Wemos is pushing out a pulse width that is rather too low. 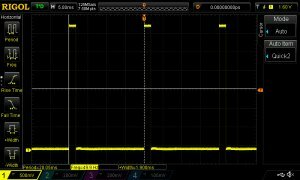 The way servo pulses are supposed to work, a servo would be at 0° at 1.0 ms, 90° at 1.5 ms and 180° at 2.0 ms pulse width. The ESC was not recognising the 0.6 ms pulses and thus refused to activate. While I had the oscilloscope on the servo tester, I measured the ‘actual’ pulse width settings that affect the motor’s behaviour. I found that, below 1.25 ms the motor wouldn’t spin up and it reached maximum speed at 1.78 ms. This data would prove useful later on. The data also showed why the logic level shifter didn’t change anything, since the ESC is triggered on 3V3 logic anyway. (I was firing blind before I scoped it). With some further experimentation, changing the degree values in the sketch enabled me to tweak the output so that not only did the ESC react to the Wemos output, but it was fine-tuned to make best use of the ‘reactive range’. The ESC only changes the motor speed between 1.25 and 1.78 ms so I tweaked the sketch iteratively until I hit upon figures of 65° for LOW and 130° for HIGH. This meant that the full range sweep of the potentiometer was in use instead of having large ‘dead’ zones at each end where nothing changed. Now I’ve got it all working exactly as I wanted it to. It took a bit longer than I thought it would, but it was educational.